Tadpole Hitler | Derek fan site: Derek DVD Available to Pre-Order Now! 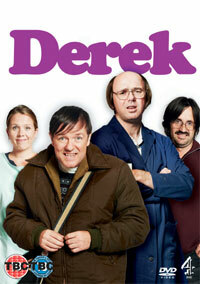 Derek DVD Available to Pre-Order Now! The Derek DVD is now available to pre-order from the Channel 4 store, priced at £14.99 and available from Monday, November 11th. Yep, it's a wait, but pre-order now and be one of the first ones to get your hands on it! "Meet Derek Noakes (Ricky Gervais) a tender, innocent man whose love for his job and the people he cares for shines through. He's 49 years old and loves animals, Rolf Harris, Jesus, ‘Deal or No Deal', ‘Million Pound Drop' and ‘Britain's Got Talent' - but his main hobby is autograph hunting. He works in a retirement home with his mate and landlord, Dougie (Karl Pilkington in his very first acting role). Derek cares deeply for old people because they're kind and funny and tell him stories about the olden days. Hannah (Kerry Godliman) is a care worker at the home and is Derek's best friend. She's smart, witty and hardworking, but unlucky in love, and like Derek, always puts other people first." Mine's ordered. To order yours, click the link at the top right of the screen!